We kicked off our festive celebrations with a trip to City Hall after we were invited to the watch the Variety pantomime Aladdin and Christmas Party. We had such an amazing time, danced our socks off and even Santa popped in to say hello! Thank you for the invite Variety. Our grown ups were invited to come and spend the morning with us making some Christmas crafts. We really love it when our grown ups come into school and spend some time with us in the classroom. Thank you! After weeks of practice, it was time for our Y2 Nativity Performance. We worked hard to learn the songs, rehearsed our lines and had a brilliant time putting on the nativity for our grown ups. In the last week before we broke up, it was Christmas Party and Disco afternoon. We had a wonderful time playing games, eating delicious party food and being with our friends. On the last day of term, Santa took time out of his really busy schedule and paid us a visit! He left us a present which we can’t wait to use in the New Year. Finally, we were very busy in the run up to Christmas, creating Christmas cards, using printing techniques to making calendars and sewing some snowmen puppets. We have had a brilliant Autumn term in Y2 and we can’t wait to see what we will be learning about in the Spring. We hope that you have all had a very merry Christmas and we wish you a Happy New Year. See you all on Monday 8th January 2018. Today was the day! Today was the day we performed our Y2 Christmas Nativity for all of our mums, dads, grandparents and other family members. We have been practising our songs, actions and our lines to make that today was perfect. Our favourite part was when we got to put our costumes on. We hope that our grown ups enjoyed watching our nativity. We loved being able to perform it. Thank you for coming to watch us! Well done Y2 – a well performed nativity. It was lovely – I am very proud of your school. Brill – fantastic as always. It was really good – all of the kids got their lines correct. It was excellent. I could watch this again and again if I had the chance! 10/10! Every year at school, we invite some people from our local community to our school to enjoy a Christmas lunch with us. This year, we had the very special honour of singing for our visitors. We have been practising our songs for our Christmas Nativity and our visitors really enjoyed listening to the songs that we sang. We hope that they enjoyed the performance, because we really enjoyed singing for an audience. If you need more information, please speak to Miss Varley. FS and KS1 Christmas Workshop – Friday 2nd December 8.35am-9.30am in classrooms. Come and join us to make some Christmas crafts with your child. 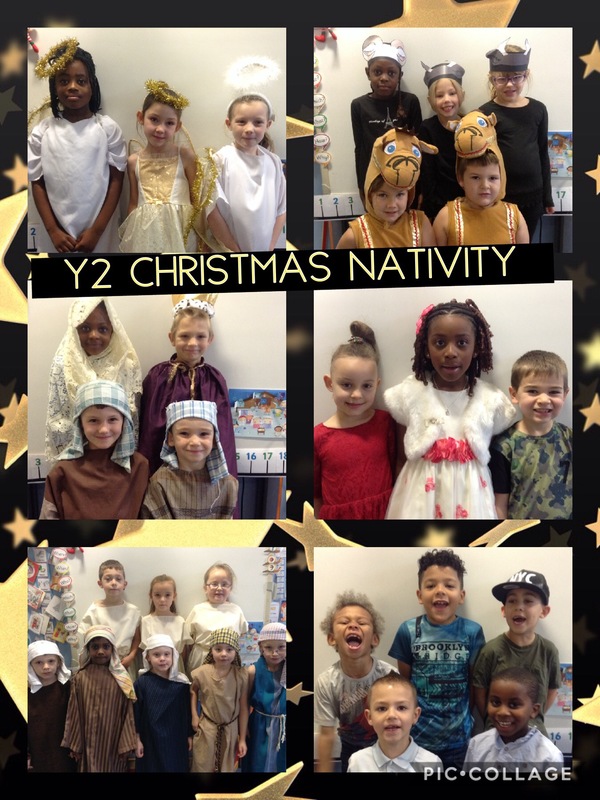 Y2 Christmas Nativity Performance – Friday 9th December at 9.30am in the hall. Year 1 and Year 2 Christmas Party and Disco – Monday 12th December in the afternoon. We will let you know closer to the time what we would like you to bring in for the party and disco.